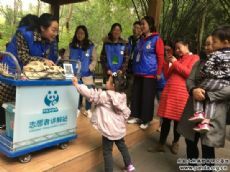 In order to improve the level volunteers possess to interpret popular science and create a strong learning atmosphere within the volunteer ranks, the Chengdu Research Base of Giant Panda Breeding held the 2018 Popular Science Knowledge and Interpretation Skills Competition for Volunteers on November 10th, which was quite successful. The Popular Competition is an activity that showcases the innovative team management of base volunteers. It has been held for the last three since its establishment in 2016. The competition consists of two parts: knowledge and interpretation. The former is divided into the individual competition and group competition, and the latter is divided into self-directed interpretation and situational propositions, which can comprehensively examine their level and improve their skills at the same time. The competition is still held in the form of voluntary self-registration. After a week of pre-selection and preparations, 20 outstanding volunteers finally arrive on stage the day of the Competition. The knowledge contest officially began at 9 am on November 10. In addition to personal responses, there is no shortage of team battles. This requires not only vast knowledge reserves, but also a spirit of comradery. Volunteers demonstrated how much they knew and took the opportunity to update and expand upon it. The interpretation contest officially began at 1:00 pm. The self-directed interpretation is a conventional interpretation to test the volunteer’s practical abilities to translate the knowledge they have learned into popular science interpretation; and the situational proposition is to extract a scenario to test the ability of volunteers to deal with emergencies. The inspired interpretations and tactful responses of the contestants provoked applause from the visitors. 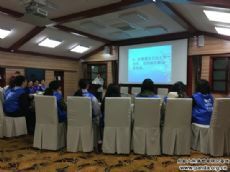 Once everyone had their chance to compete, first prize, second prize, third prize and excellence of the 2018 Popular Science Knowledge and Interpretation Skills Competition for Panda Base Volunteers were finally awarded, and the faculty members commented on the competition today. They fully praised and thanked all the volunteers who participated in the competition. 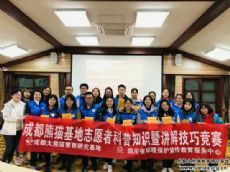 The volunteers shared their experiences and feelings during the competition, and expressed that if they have the chance, they will compete next year. So far, the 2018 Popular Science Knowledge and Interpretation Skills Competition for Volunteers ended successfully. The competition is not only a comprehensive test for volunteers' knowledge and interpretation skills, but also a way to retrain and replenish the volunteers’ popular science knowledge. At the same time, the volunteers enhanced their communication skills through this competition, which strengthened team cooperation and team building.